This is a snapshot of quite amazing efforts by Rotarians in Frome to live up to their declaration “Service Above Self” during the darkest days of World War Two. It also tells of the efforts of their wives in their Inner Wheel Club, to help Servicemen. Just four months after war was declared the club “adopted” a trawler, commandeered and pressed into service minesweeping in the Dover Channel. Her name, HMT John Cattling. The Rotarians were not to know she was working in such a “hot spot”, which was to become even “hotter”. During the dreadful days of the Dunkirk Evacuation she was clearly a life-saver for many because, being just 276 tons, 125 feet in length and drawing just 12 feet 8 inches in depth, she could go inshore and rescue men. Indeed, she was lucky to survive herself when Stuka bombers sunk two sister ships and badly damaged a third whilst the flotilla was alongside Dunkirk’s east mole. In Frome Rotarians knew nothing of this until a pencil-written letter from the fisherman skipper modestly said he had been awarded the Distinguished Service Cross. There was no detail, censorship was strict, but the wily Rotarians noted that the letters were posted in Dover! It is only post-war that it has been possible to find and tell this story. Within months more of the crew of the John Cattling were decorated, quite an achievement for a small trawler with a crew of 20. A later letter said the John Cattling had been awarded two DFCs, two DSMs and two Mentioned in Despatches. “This adoption is one of the best pieces of social service that our clubs have ever undertaken, and I am pleased to conduct the correspondence with the Skippers. Early in 1940 the Frome Rotary Club, together with the Inner Wheel, adopted the Steam Trawler John Cattling. Every month they sent the crew a parcel consisting of groceries, toiletries, cigarettes, etc. Also the ladies of Inner Wheel were kept busy with their knitting needles. The crew often requested jumpers, socks, scarves and mittens. It is easy to imagine what these comforts meant to the crew during those trying times, showing one more aspect of the generosity of the Frome inhabitants. 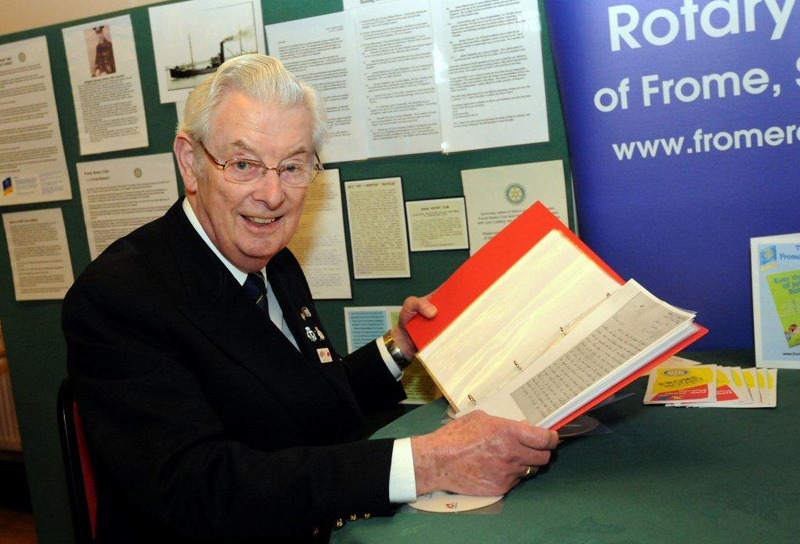 Letters written by Skippers of the minesweeping trawler, HMT John Cattling, are on display, thanks to the diligence of the Rotary club’s Archivist, Roy Sandoe, in keeping and collating the Frome Club’s records. Please note that some of the letters are written in pencil, which emphasises the conditions when sent. Note also, that all are C/o the GPO London, a familiar address to sailors who could never say – and probably quite often never knew – where their ship would be when replies were sent from home. The Skipper of the trawler when adopted was George Aldan, who became a Lieutenant Royal Naval Reserve, which surely means he was a fisherman mustered into the Royal Navy. Records show the DSC he was awarded at Dunkirk was not for minesweeping. It was for his bravery during the evacuation. Further research records that whilst in Dunkirk harbour she aided the destroyer HMS Grenade, mortally hit by two bombs. The John Cattling towed her away from the main channel to the edge of the outer harbour where she exploded. John Cattling, herself, brought out 77 troops. Skipper Aldan was wounded a few months later but not whilst at sea! He was a casualty of German bombers whilst ashore on a brief leave. In a letter he says a bomb dropped five yards behind him, making a 20 feet deep hole! He escaped with four wounds! His modest words were: I received a packet last Wednesday evening and am now taking a little rest cure.! Frome Rotary Club kept in touch and asked the Chatham Rotary Club to visit him in hospital. As a result a new Skipper, George Burwood, was appointed to the John Cattling, in September, 1940. Skipper Burwood, likewise, kept in touch with the Rotary Club, until he moved on in April 1941. Chief Skipper Albert Bowles was in command for a couple of months and then Skipper Tom Smith took over until late 1942. Letters in the archive show that all found time to respond to the letters and parcels from Frome. The next Skippers were Joseph Arnold for a year until December 1943, when Bertram Carlton took command until September 1944, with Alfred Halliwell, DSC, becoming the final Skipper before she hauled down the White Ensign. “I am sorry I could not write before as we have been busy this week. You have congratulated me, would it make you any more pleased to know that your ship has got two DSC’s, two DSM’s and two Mentioned in Despatches for meritorious work at Calais as well as Dunkirk. “Don’t you think I am proud of the old ship? “I was lucky enough to have a bomb drop about five yards from me and escape with only a few scratches which was enough to put me here (Royal Naval Hospital, Chatham). First of all, let me thank both you and the members of your club for their kindness to myself and my crew. We all appreciate the things you have sent, and realize that to send us the cakes someone must go short of sugar, etc., owing to rationing. We are still policing the channel and the weather has been good to us lately, for which we are thankful. I have at last managed to secure permission to have the ship and crew photographed and have pleasure in sending you one. I will endeavour to give you a brief summary of the crew. I have numbered everybody off from left to right, starting on the back row. 8) George Burrows, age 29, a Fleetwood fisherman who started the sea at the age of 16, as a deck-hand, working his way slowly up, he is married, with two children, and he is serving as second-hand on board our ship. 9) Tom Buckley, age 21, a Manchester clerk who had never been to sea before in his life, until he joined the J.C., and now thinks there is no other life worth living. He is thinking of getting married on his next leave, he is our Sparks. 10) Leslie Harrison, age 19, from Birmingham, also a clerk, never having been to sea before, and wishing he still hadn’t. A young boy, trying to do his bit, he is our “Bunts”. 11) Geoffrey Hey, age 21, from Halifax. A woollen spinner, he also had never been to sea before and still does not think much of it. He is one of our stokers. 12) Russel Winney, age 36, from Ipswich, who served in a tailor’s shop for 21 years, and was also a great yachting enthusiast. Tried to get in as a writer, but is now using a shovel instead of a pen. He is married and has a daughter of 10 years. He is also a stoker. 13) Charles Kuble, age 22. From Barrow-in Furness, who served as assistant cook in cargo ships, so is no stranger to the sea. He is our cook. 14) Earnest Smith, age 25, from Milford Haven. A fisherman starting the sea at the age of 16 years. Married with a young wife and baby daughter. He is our Leading Seaman. 15) Earnest Yarborough, age 24, from Grimsby. Starting as a deck-hand on a trawler at the age of 16. You already know he won the D.S.M. He is married and has one daughter. He is our Gunner. 16) George Macdonald. From Fraserburgh, Scotland, aged 27, was a cooper by trade, also had little sea experience. Married with a wife and three children. He is one of our Seamen. 17) Kenneth Gurdlestone, age 19, from Grimsby, who had just started to serve on trawlers when he was called up, also a Seaman. 18) John Donothy, age 22, from Hexham, he was a house decorator and painter in civil life, who took to the sea like a duck to water, also a Seaman. 19) Frank Binfield, age 21, from Gillingham. He was a traveller for one of the local tailors, and had never been to sea, but now enjoys it immensely. He is our Ship’s Steward. 20) George Scrimgour, age 32, from Blythe. He was a Donkey-man in the Merchant Navy, starting the sea at the age of 18 years. A married man with a wife and two children. He is our 2nd Engineer. 21) James Foster, age 27, from Hull. Starting as a spare-hand at the age of 19. He is single but considering marriage. He is our Point Five Gunner. 22) Joe Pendergast, age 27, from Hull. He started the sea as a trimmer at the age of 15, is married and has three children. He is going through for engine-man, and is one of our Stokers. 23) Kenneth West, age 24, from Whitstable. Was a butcher by trade, also a keen yachtsman. He is the man who looks after our diesel engine. He is married with a wife and young baby. 24) Myself, age 34, from Aberdeen, Scotland. Starting the sea at the age of 15, as a deckhand and working my way up the tree until I reached the position of Skipper at the age of 24. I am married, and have a young daughter age 5½. I am Skipper and in charge of the ship. 25) James Mason, age 35, from Milford Haven. Starting the life of a fisherman at the age of 18, and gradually working his way up to Chief Engineer. He is single and does not believe in women and marriage. He is our Chief Engine-man. 26) Ernest Emery, age 24, From Hertfordshire. In civil life was an electric wireman. He had never seen the sea until he joined the J.C. He has done some good work since he joined, being mentioned in dispatches, also thinking of getting married on his next leave. He is our wireman. 27) George Greener, age 26 from Southend, was a cabin boy in passenger ships and always complains when we are not at sea. He is single and intends to remain that way, or so he says. He is another of our seamen. 28) Alfred Littlefield, age 22 from London. Was a flour-mixer in civil life and does not like the life of a sailor. He is our assistant cook. I have now mentioned all the members of our crew, except the cat, which we picked up from a piece of floating wreckage, from a ship which had just been sunk by a mine. She makes a nice pet and is well cared for by the boys. As you will notice we are a mixed crowd, but never-the-less get along quite well together. We unfortunately have our longest serving member of our crew in hospital, with a bad accident to his finger. His name is Thomas Weston, age 21 from Birmingham. A glass-blower by trade, and now serving as a stoker on board. You will realize that being at war the ship has had many changes of crew, but is still the “J.C.” which has done so well on the Dover Patrol. G. R. Burwood Sk R.N.R. P.S. I hope you will accept my apologies for being so long in replying, only we have been waiting for the photographs to come through. First Commanding Officer of HMT John Cattling was Skipper George Aldan. His bravery at Dunkirk earned him the DSC, (the Distinguished Service Cross). Whilst alongside the harbour wall in the stricken evacuation port, his ship along with others was dived bombed by Stukas. Two sister ships were sunk, another badly damaged, and a destroyer mortally wounded. George Aldan and his 19-strong crew towed the destroyer, HMS Grenade away from blocking the channel, out to the edge of the outer harbour where the destroyer exploded! The John Cattling, with her crew of 20, herself brought home 77 soldiers. None of this detail was known to the Frome Rotarians. George Aldan, a fisherman in peacetime, after being injured, moved on to command a sister ship, HMS Gwenllian. In the King’s Birthday Honours of 1942 he was Mentioned in Despatches and in April 1944 he was decorated again. He received a Bar to his DSC for “Leadership, skill and devotion to duty in an important minesweeping operation in the Humber area in January 1944”. By that time he was promoted to be a Lieutenant, RNR, (Royal Naval Reserve). Six sailors’ lives were saved by the John Cattling on May 24, 1940. She picked up an officer and five ratings from a carley float, survivors of the destroyer HMS Wessex, which was bombed and sunk as she left Dover. Carley floats were made just a few hundred yards from this museum at Notts Industries, Frome, during World War Two. Many lives were saved with the floats. One is an exhibit in the museum. Sadly Skipper George Burwood was killed on January 13, 1942. During an air raid bombers struck the stone-frigate shore base, HMS Europa, in Lowestoft and a number of Royal Naval men and women died. Before joining HMT John Cattling – succeeding Skipper George Aldan, when he was injured ashore in a bombing raid – Skipper Burwood survived the sinking of his previous ship, another mine-sweeping trawler, in a collision with a mystery ship. This entry was posted in Documents and tagged Document on April 5, 2012 by Fred Smith.